Gone are the days when you could silently hate a rival or pursue a lawsuit behind closed doors, should they happen to harm you. In the world of social media, brands are vocal, not afraid to call out their competition and demand instant justice, all amidst the prying eyes of the public. So, when Freshmenu, a storied food startup from Bangalore, was running ads on the keyword ‘Eatfresh’ on Google, Eatfresh (A close rival to Freshmenu) didn’t take kindly to it. Now, Google runs sponsored ads on its search engine, along with a list of useful websites based on your search term. The advertiser chooses the keywords for which they want the search term to match to churn an ad. For most brands, choosing keywords within their category, and their own brand name is standard practice. Some even go as far as to choose a competitor’s brand name. Ethical? Probably not. Illegal? No. Google, oddly, does allow the use of competitor keywords under its trademarks policy. The only thing it does disallow is use of the keyword in the adtext. So, when Freshmenu chose to trigger its ad on Google on the keyword “Eatfresh” and hence poaching the traffic meant to come to Eatfresh, the latter wasn’t pleased. 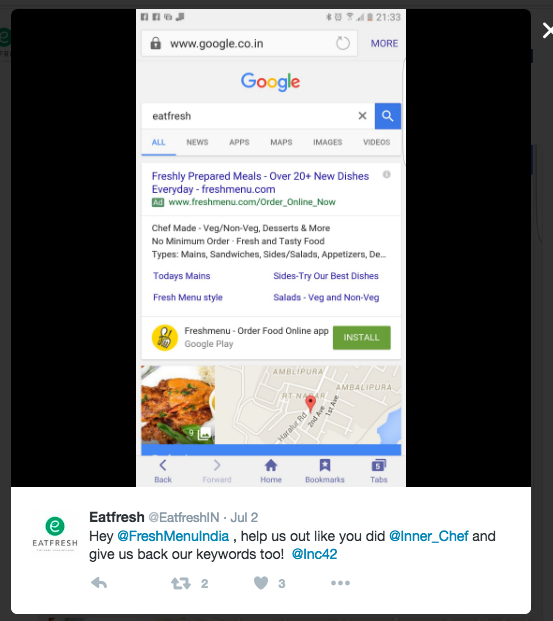 The company posted a polite but biting tweet to Freshmenu asking it to “return its keyword”, followed with a screenshot of Freshmenu ranking first on the keyword ‘eatfresh’. Apparently, this also happened with another food startup Innerchef, whose name Freshmenu had been using as a keyword and after a report by media website Inc42, decided to stop using Innerchef as a keyword. However Freshmenu seems to have not relented on using Eatfresh as a keyword yet. We tried it ourselves, and indeed Freshmenu continues to serve ads on ‘Eatfresh’, while the other way around, not. EatFresh and Freshmenu are both into providing ready-to-eat, chef-made gourmet meals, and compete closely, amidst a market chock-a-block with food startups. It’s obvious the two are locked in a severe battle to capture a larger slice of the market in the city and in a scenario where brand loyalty is sparse, and good food is a Google search away, appearing at the top, at least on Google, makes all the difference.